The Forum Auditorium is home of the Harrisburg Symphony Orchestra. It’s located in the southeast corner of the State Capitol Complex at 5th and Walnut Streets. Owned by the Commonwealth of Pennsylvania, the Forum also serves as the site for various public ceremonies, graduations, seminars and governmental conferences. 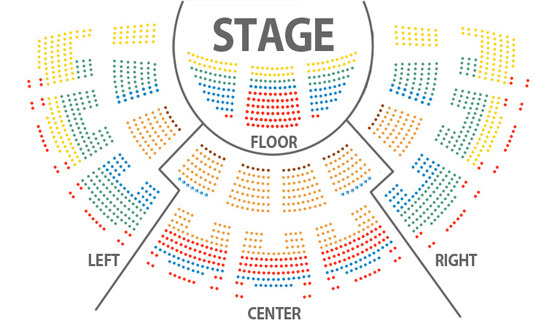 Seating for patrons who use wheelchairs is available on the middle tier of the auditorium. (Last row of sections 204 and 207) Patrons sitting in these areas should use the lift located in the stairwell below Section 302. A chair will be provided for companions of wheelchair patrons. Accessible seating (free-standing chairs) is also available in the Promenade. To reach the Promenade level without encountering stairs, enter the Forum at the back of the building – the State Library entrance off South Street. Both handicap-accessible sections are ticketed. If you need accommodation, please contact us in advance of the concert. Please do not assume that we will be able to accommodate a last-minute change of seating. Please be advised that accessible seating at the Forum is limited. Symphony staff will attempt to meet individual needs. If you have any questions about appropriate seating, please contact the box office at (717) 545-5598 before purchasing your ticket(s). We will be happy to discuss your seating requirements. Multi-instrumentalist/vocalist phenom Dave Bennett brings his high-energy band to trace the “roots of pop,” beginning with the swing era and moving through Rockabilly, Elvis, Jerry Lee Lewis, Roy Orbison, the Beatles, and other genre-defining stars. Celebrate Mother’s Day with family and music! The Harrisburg Symphony Youth Orchestra and Junior Youth String Orchestra perform orchestral favorites under the direction of Maestros Gregory Woodbridge and Krista Kriel. Our season concludes with the ever-popular New World Symphony by Dvorák. On the first half, English composer Arnold Bax’s atmospheric musical portrait of the Tintagel castle on England’s Cornwall coast, plus a new violin concerto by Jonathan Leshnoff.